This full-disk image from NOAA’s GOES-13 satellite was captured at 11:45 UTC (7:45 a.m. EDT) and shows the Americas on June 21, 2012. Beachgoers, rejoice! 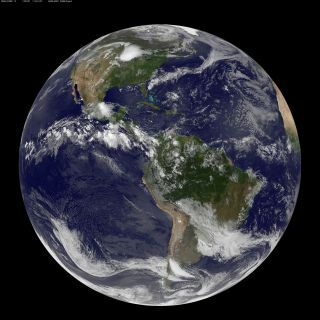 The summer season for Earth's Northern Hemisphere officially began today (June 21) and a U.S. weather satellite has captured a spectacular view of our planet passing the annual milestone. A photo released by the GOES-13 weather satellite reveals a sparkling blue Earth dotted with clouds to mark the northern summer solstice — the official start of summer in the north. The satellite is operated by the National Oceanic and Atmospheric Administration. "This full-disk image from NOAA's GOES-13 satellite was captured at 11:45 UTC (7:45 a.m. EDT) and shows the Americas on June 21, 2012," officials with NASA's Goddard Space Flight Center in Greenbelt, Md., explained in an image description. "This date marks the start of astronomical summer in the Northern Hemisphere, making it the longest day of the year!" During the summer solstice, the sun appears to shine farthest to the north of the equator, over the Tropic of Cancer, and begins its trip southward. The event marks the longest day of the year in the Northern Hemisphere and the start of summer. In the Southern Hemisphere, it marks the start of winter. For northern observers, the sun's apparent peak in the daytime sky will gradually grow lower until it reaches its lowest point on Dec. 21, marking the winter solstice and start of northern winter. On Sept. 22, the sun will cross the equator, marking the autumnal equinox and start of the fall season in the north (and spring in the south).